Glen Brough was elected to the Phantom Regiment Board of Directors in 2009. 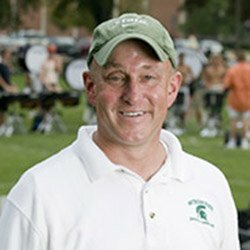 He is assistant director of admissions at Michigan State University and has been visual coordinator of the MSU Spartan Marching Band since 1988. Glen first became involved with Phantom Regiment as a member of the visual staff in 1993 and then as a donor. He is a part of the board’s development committee. He was a drum major at Michigan State for four years and has written more than 100 high school marching band shows in the past 35 years. Originally from Grosse Ile, Mich., Glen has a bachelor of science degree from Seton Hall University (1981) and a master of arts degree from Michigan State (1986). He is married and lives in Bath, Mich.